Many of us can remember the days of catching frogs and hunting for salamanders. This pond has been created to provide standing water habitat and breeding sites for amphibians separate from the flowing creek. Amphibians have thin, moist, glandular skin, and usually live part of their life as aquatic larvae breathing through gills and then metamorphose into adults. Frogs, toads, salamanders, and newts are all amphibians. The pond is a great place for frogs and toads to lay their masses of gelatinous eggs which will turn into tadpoles before transforming again into adults. Perhaps the aquatic Red-spotted Newts will arrive to live in the pond. Mammals, birds, reptiles, and insects will surely visit as you are now doing. In the winter, cold-blooded amphibians are nowhere to be found as they hibernate under the pond mud or below the frost line in the fields and forests. A well planned pond in your garden will attract amphibians that just love to eat slugs, flies, and mosquitos. Look for tadpoles. If you revisit, watch for any changes in the tadpoles, like legs! Look and listen carefully. Can you see or hear any frogs? 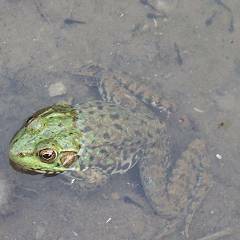 Frogs and toads are not very active in the late fall. But, mammals are active. Can you name one difference between mammals and amphibians? Where are all the frogs and toads now? How do they survive winter?